Logan Schafer had never been part of a triple play before. His first one was an unforgettable experience. 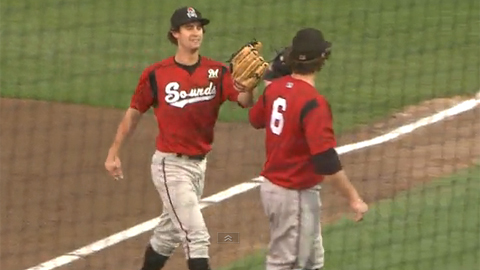 The Nashville Sounds center fielder caught a ball off his head to start an unusual triple play in Saturday's 4-1 road win over the Omaha Storm Chasers. Nashville had a 4-1 lead when singles by Irving Falu and Lorenzo Cain put runners at first and second in the bottom of the third inning. Clint Robinson followed with a liner to deep center field. "It started with a line drive and it looked pretty well hit off the bat," Schafer said. "I didn't know if I would need to go in on the ball and I got a late read and then I realized it was hit with some backspin and was going back. "I felt like I didn't have enough time to turn around and I reached up my glove. [The ball] went straight up, hit me in the head and I tried to scoop it up. It was a whole lot of luck and it was pretty crazy." Once the ball struck Schafer's head, Falu and Cain took off. After Schafer plucked the ball out of the air, he fired it back to second baseman Eric Farris. "The last thing I'm thinking about when a ball is possibly over my head is where the baserunners are," he said. "What I'm trying go do is get the ball back into the infield as fast as possible. He [Farris] knew what to do when he got it. The runners did what they're supposed to do once they saw it bounce off my head. It was pretty lucky." Farris stepped on second to double up Falu and fired over to first baseman Mat Gamel to complete the Sounds' second triple play of the season. With the Sounds protecting a three-run lead, it was a game-changing play. You wouldn't have known it from the reaction Schafer got in the dugout. "It was a little bit of disbelief and a lot of humor," the California native said. "When the ball hits you on your head, it's pretty embarrassing, but I'm glad I could catch it. They were all laughing quite a bit, it's a pretty funny play. Everyone was kind of in disbelief and they were all cracking up." Schafer said the Sounds submitted the play to ESPN with hopes of seeing it make it onto SportsCenter. The 24-year-old had just one hit but is batting .352 in 29 games since he was promoted from Double-A Huntsville. Overall, he's hitting .320 with four homers, 40 RBIs and 13 stolen bases in 88 games across three levels. "Hitting is a lot of confidence and it depends on where you are mentally," Schafer said. "This team, they've been playing well and the confidence they have has been through the roof. It's fun. Hitting is contagious. I just get into the flow and try to get on base for the guys behind me and go from there. " Taylor Green was 2-for-4 with a double and an RBI, while Caleb Gindl plated a pair of runs for the Sounds. Josh Butler (8-7) earned the win after allowing a run on six hits over six innings. Daniel Ray Herrera notched his first save with three scoreless frames. Mike Montgomery (5-8), the Royals' No. 3 prospect, surrendered four runs on seven hits and struck out seven over seven innings for Omaha. Robert Emrich is a contributor to MLB.com. This story was not subject to the approval of the National Association of Professional Baseball Leagues or its clubs.